Product #21903 | SKU BLX24-SM58 | 0.0 (no ratings yet) Thanks for your rating! The BLX24 Vocal Wireless System with SM58 Mic from Shure includes a BLX4 wireless receiver and a BLX2 handheld transmitter with an SM58 microphone. This system is set to Shure's M15 frequency band between 662 to 686 MHz. The system has up to a 300' line-of-sight range of operation and is designed for easy setup. The BLX4 receiver's one-touch QuickScan frequency selection finds the clearest available channel and tunes the unit to it. Its front panel LCD display indicates the group and channel it is tuned to, allowing you to set the BXLR2 transmitter to match. A dual-coloured LED indicator displays green for normal audio levels and red to alert you if your levels are clipping. The two antennas have microprocessor controlled internal diversity to help prevent interference. Two included AA batteries provide the BLX2 transmitter with up to 14 hours of operation. You can use up to 12 compatible BLX systems simultaneously per frequency band. The BLX2 Handheld Transmitter with SM58 Microphone from Shure is tuned to Shure's M15 frequency band between 662 to 686 MHz and provides a 300' line of sight operating range. It is powered by two included AA batteries for up to 14 hours. 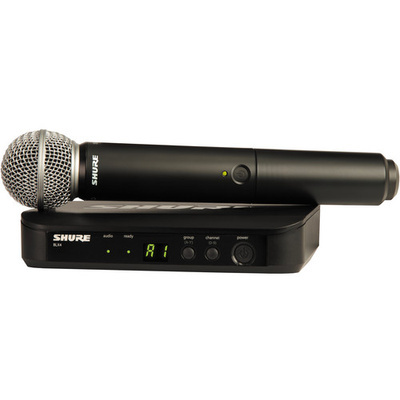 It is compatible with Shure BLX wireless systems set to the same frequency band. A padded zipper case and microphone clip are included. The BLX4 Wireless Receiver from Shure is a single-channel receiver set to Shure's M15 frequency band and operates between 662 to 686 MHz. It has microprocessor-controlled internal antenna diversity for reduced signal interference and dropouts. The one-touch QuickScan frequency selection feature allows you to quickly locate the frequency with the least amount of interference available. Its front-panel dual-colour LED status indicator displays green for normal levels and red when clipping for fast metering. It has an XLR output in additional to an instrument level ¼" output. The BLX4 can be used with up to 11 other compatible systems simultaneously per frequency band.